Frost. A swear word to farmers throughout the bulk of the growing season. An event that can quite literally ruin a crop overnight. This week, our farm experienced multiple nights below freezing, with a couple of nights nearing five degrees below zero. Granted, September 10-15 is actually a pretty normal first-frost date on the Canadian Prairies. So what is everyone so worried about? I think the emphasis needs to be placed on “normal first frost”. The 2014 growing season has been anything but normal; with a very late start to seeding, a cold, wet spring and a very wet start to summer, crops did not exactly get a stellar start. A late start to seeding became a late finish, with many crops seeded well into June. Cool, wet weather slowed their emergence and establishment, and torrential downpours set them back substantially. We were set up for a late crop, as even the fields seeded at the end of May were of a concern. Summer allowed us to forget those fears, with 6 weeks of beautiful weather allowing our crops to flourish. While the damage from the rain had already been done, with substantial areas flooded out, it was looking like crops just might turn out alright. Nevertheless, we would still need at least the 20th of September without a frost to get everything mature in time. We now know that that was not to be. The weather took a turn for the worse at the end of August, with wet, cool weather returning. 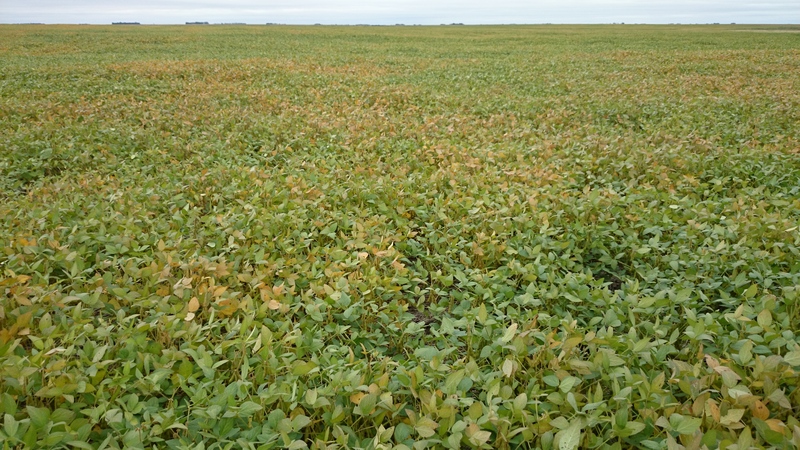 Fields became increasingly wet, disease levels shot up, and crop maturation rates slowed. 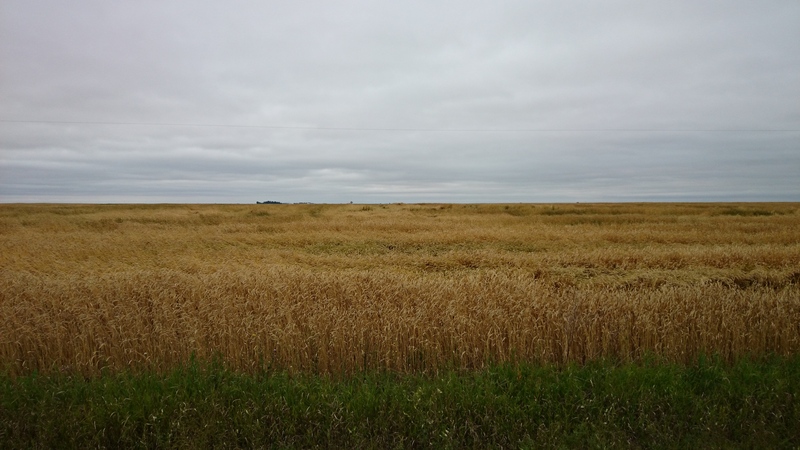 Now, after weeks of wet weather ruining the quality of our wheat and durum crops, frost has severely damaged our later cereals, in addition to our flax and soybeans. What Does An Early Frost Do? Like many aspects of crop production, the answer is, quite simply, it depends. A “frost” is really not as simple as it sounds. Sometimes, it can freeze only for a couple of hours and only a couple degrees below freezing. This does minimal damage. Obviously then, a frost well below zero for many hours will be much worse. A frost like that kills- well, everything. 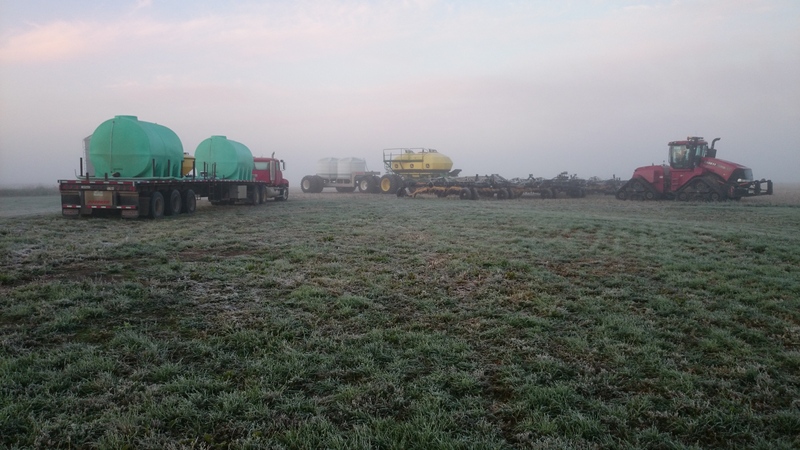 A cold and frosty morning for seeding winter wheat- and for immature crops. Imagine a lovely old wheat plant, wearily nearing the end of its lifespan, slowly stashing away all its nutrients, all of its sugars, and all of its hopes and dreams into its progeny (okay, maybe I’m being a little melodramatic here). Giving itself entirely to its offspring, our tired old wheat plant is getting ready to shut down for good and release its newborn seeds. Suddenly, out of the blue, WHAM! a frost hits, and our poor old wheat plant suddenly dies. It cannot fulfill its lifespan. Instead of a slow, methodical shutdown to prepare its offspring for the world, the plant is suddenly finished, leaving the immature seed out on its own- and it’s not ready for that yet. The still immature seed, depending on its level of maturity, will stay green forever; or, if older, will shrivel up, unable to finish filling to its required plumpness. The green seeds are useless to us as a commodity, and even the more mature but still-shriveled seeds will weigh up poorly, costing yield, and will not fulfill their primary purpose: making bread. Ultimately, you, as a customer, will not want bread from shriveled up, frozen wheat. It won’t rise properly, it won’t taste right, and it won’t look very nice. That all comes back to us, and our product. If the customer doesn’t want it, it’s no good. It isn’t a total waste, however; it will likely get blended off with better wheat, or worst case it will be fed to livestock. Either way, it’s not worth much. That wheat may have been worth $7 per bushel or better as a #1, high protein milling wheat, but as feed or close to, it may only be worth $4-5 per bushel (or worse, sometimes). That is a 30-40% drop in income, all from one night that just got a little too cold. For our farm this year, this early frost will hurt our soybeans, some of our latest spring wheat, and our flax. While quality isn’t as much of an issue on flax and soybeans, yield will decline. How much is quite difficult to estimate at this point; we will know when we start combining those crops. These soybeans are not ready for a frost yet. This is two days before a hard freeze. The early frost is just one more strike against an already tattered crop. Quality wheat and durum will be in very short supply this year, and it will be very difficult to move all of what we have in a timely fashion. Sadly, the area hit by the rain and frost is a large one, and none of us will have much good quality cereals to blend off the bad stuff with. Such is the nature of farming; the harsh reality of the life we have chosen. I’m not writing this to ask for sympathy (particularly when I hear about those who were in the snow path this week- that’s a nightmare); rather, I write this to show what a rollercoaster life on the farm can be. One year can be the harvest of a lifetime, and the next can be a harvest you’d sooner forget. Dealing with these ups and downs is incredibly frustrating and financially difficult at times, but it’s all part of the crazy life that is farming. I signed up for this the day I decided I wanted to return to the farm, and I don’t regret it for a minute. Previous Article Why is Rain Such a Problem at Harvest?